You’re taking a road trip, with nothing but the bag on your back and your wallet in your pocket. All of a sudden, you face a downpour unlike you’ve never seen. There isn’t any shelter for miles and you don’t have a travel umbrella with you. If you stay in the rain long enough, all of your cards and cash will get ruined. Don’t you wish you have a reliable way to keep your cash, cards and other important things dry? With the best waterproof wallet, you can. Waterproof wallets are not your typical cash-carrier due to their compact design and obviously their ability to keep your cards and money from accidental water. They can also carry other valuables like passports, keys, SIM cards and more. However, how do you exactly shop for waterproof wallets? Well, hopefully this article will help you get started. First we’ll demonstrate some key features you should be looking for when shopping. On top of that, we will present a list of some of the top rated products in the market. Let’s take a look at some waterproof wallets. When looking for a waterproof wallet, the material is the most important feature to keep an eye out for. Thankfully, a majority of the products out there use materials and fabrics that are designed to withstand wet environments and elements. However, there are still some differences to keep in mind. Wallets that use fabrics like nylon and Tyvek are said to be water-resistant to a certain degree. They won’t absorb water easily if they happen to get wet. However, with enough submersion, water may soak through eventually and damage the contents of your wallet. Plastic materials such as TPU, however, can withstand water to a much greater degree. These kinds of wallets have a sealing mechanism that keeps water out to a certain depth. And with enough air trapped inside them, they can float so you won’t lose your wallet overboard if you’re traveling by boat. Do you want a wallet to keep your most important cards for a short trip, or do you need something more versatile that can carry everything you have? This question is important in determining how many credit cards and cash you can bring with you, as well as whether you need something to carry your passport in. Keep in mind, however, that there’s a correlation between the carrying capacity of a wallet and how big it will be. 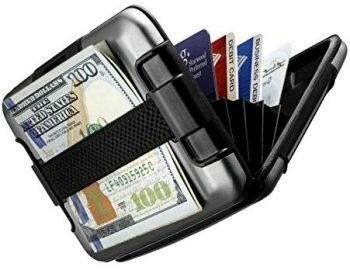 Something that can carry 10 or more cards typically won’t fit inside your pants pocket, so if you’re looking for something easier to travel with, you may want to consider a wallet that can only hold a few cards. The weight of your wallet could be dependent on how big it is, but material plays a big part in this also. It’s safe to say that you don’t really want a wallet that will keep reminding you that you’re carrying it because it’s too heavy. 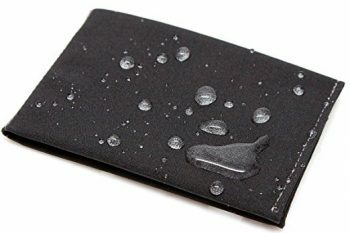 The majority of waterproof wallets are designed to be light, both in terms of material and the ability to float if you drop it into a body of water. Either way, you don’t want a wallet that’s going to feel like a heavy brick in your back pocket. Although the material of your wallet may be resistant to moisture, that doesn’t make it entirely durable. Wallets that choose to use plastics such as TPU and PVC, for example, cannot be stored in open sunlight. This causes the materials to break down over time, rendering your wallet useless. In addition, you want a wallet that’s still going to function, no matter how many times to shove it into your pocket and take it out again. It should withstand some rugged use, not fray easily, and should be resistant to abrasions and punctures. After all, there’s no point in spending money on a wallet that you’ll end up replacing in a few weeks. Wallets haven’t been left out with the improvements constantly being made to technology. Many new wallets are being made with RFID-block technology added to the lining, or sewn into the fabric itself. This feature is important for those who travel often, and don’t want their credit card information being used to make illegitimate purchases. Thankfully, this technology adds no weight to the wallet itself, so you won’t have to worry about bulk. The wallet enclosure can also make a different. Perhaps you may want one that folds close so that you can get to your cards and cash. Or maybe you want something more secure with a zipper enclosure or lock seal that may take some more time to get into, but is guaranteed to keep your belongings safe. Now that we’ve discussed what you should be keeping in mind when you’re shopping for a waterproof wallet, it’s time to take a good look at some of the best products we’ve found. Each wallet has obtained a customer following due to their quality, the features they offer, and how well they protect your belongings. 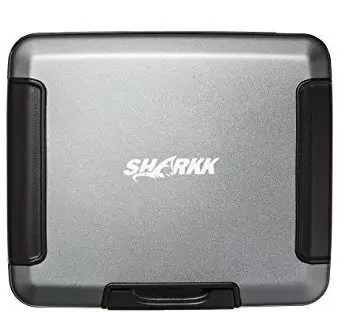 The sleek and durable Sharkk RFID Aluminum Wallet could be everything you’re looking for in a waterproof wallet. It has a high-grade design that’s guaranteed to keep your belongings safe from water and theft. With the RFID-blocking technology added to the aluminium in the case, your credit card info remains safe from the clutches of thieves. The accordion-style storage allows you to store up to 7 cards without adding much bulk, so it can easily fit inside your pocket. It’s also very user-friendly: it’s easy to close and open, and snaps shut without much effort. The cash band added to the outside is a big improvement, as there’s very little space in the interior to store your cash. The band is durable and versatile enough to hold as much or as little money as you need to keep on your person. No more crumpled bills in your pocket, or watching loose cash falling to the floor. Related: Looking for a great way to keep your head warm without spending a lot of money? The Condor Tactical Microfleece Cap is a great choice, as it’s made from the softest, warmest material you can find. You can fold up the edge, or you can leave it down to keep your ears warm. If you’re looking for a wallet that won’t have any problems fitting in your pocket, then the SlimFold Minimalist Wallet could be exactly what you’re looking for. This wallet is so small, you’ll wonder how you’ll be able to fit up to 8 credit cards inside, and still have room for cash. This thin wallet also features RFID-blocking technology, so there’s no need to worry about your credit card information being taken ever again. And all of this is available without adding any bulk whatsoever to this almost paper-thin wallet. And if you’re worried about water-resistance, the Tyvek material of this wallet has you covered. The fibers are 0.5 to 10 micrometers; for comparison, a human hair is 75 micrometers. It’s the same material used in Express Mail envelopes used by the USPS, and those are guaranteed to keep their contents dry. Overall, this is a solid waterproof wallet for a fair price. Related: You shouldn’t be uncomfortable when you’re hiking, but if you’re wearing shorts, having your socks show can be a fashion faux pas. Instead, consider the Hanes 5-Pack Ankle Socks, which are not only comfortable, but will stay below the level of your sneakers. They’re also moisture-wicking to keep your feet cool, and have supportive to seams to ease the ache in your feet. The Roomi All In One Travel Passport Wallet is one of the best travel wallets to consider, as it will keep all your documents together in one place. In addition to the cellphone pocket on the outside, the interior has room for 5 cards, 2 passports, and still have room for your cash. It zips up easily, and the wrist strap makes it easy for you to keep everything at hand instead of fumbling in a backpack. This wallet comes with RFID-blocking technology, so you’ll never have to worry about your credit card numbers being stolen ever again. Too many times have travelers suffered from receiving outrageous credit card statements with purchases they never made. But with this wallet, those worries can be put to rest. Lastly, the Roomi wallet is made with a high-density nylon that’s very water-resistant. That makes it a perfect choice to take with you to wet climates or situations, making it the perfect travel companion. Related: You’ll never have to worry about paying for overweight luggage again with the Etekcity Digital Luggage Scale. All you have to do is hang your bag from the strap, and the digital scale will tell you exactly how much it weighs. You’ll save a lot more on luggage fees than the price of this scale itself. The Sharkk RFID Aluma Wallet is a slim, accordion-style wallet that can hold up to seven cards of various sizes. The locking mechanism ensure that your wallet won’t fall open when you drop it, keeping everything secure. It also ensure that no water will get in, so your credit cards and business cards won’t get soaked and destroyed. This wallet will also prevent your identity from being stolen. With RFID blocking technology, no one will be able to scan the contents of your wallet and steal your secure information. That means no more mysterious purchases on your credit card from a different state or country. Lastly, despite the metal look, this wallet is extremely light and won’t feel hefty in your back pocket. The choice of aluminium makes this product lightweight, sturdy, and won’t corrode over time. That means a great looking wallet for the rest of your life. Related: If you’re looking for a durable pair of pants that are guaranteed to keep you cool, then look no further than the TRU-SPEC 24-7 Tactical Pants. They’re made from ripstop polyester, so they won’t snag or tear. They also have plenty of pockets for you to keep all your important devices and tools on your person. 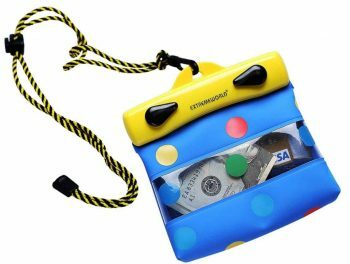 This bright and colorful EXTREMEWORLD TPU Waterproof Case Bag is so much fun, even your kids will want to carry their small items in this. It’s perfect for taking belongings with you, especially if you’re heading on trips involving water. It’s hermetically-sealed to keep out moisture, dust, and any other hazard that could ruin your belongings. Testing the lock his highly encouraged to ensure that it will work; seal the bag, submerge it under water and squeeze it gently to get the air out. The bag shouldn’t leak at all, but if it does, then the seal needs to be cleaned. You can also leave as much air as you want in the bag so that it floats. Because of the nature of the bag, it’s recommended that you don’t store any sharp objects inside, nor should you keep it in direct sunlight, as this can damage the structure over time. Related: If you’re looking for something bigger to keep the rest of your belongings dry, then you may want to consider the Freegrace Waterproof Dry Bags. You get a pack of three – a 5L, 10L, and 20L bag – as well as a waist pouch and a phone case, all waterproof. And if you seal the bags with some air inside, they’re guaranteed to float, so no lost belongings to the bottom of the ocean or river. The FLYMEI Multifunctional Travel Wallet is a handy wallet that is invaluable for any traveler. It has an attractive exterior made from a high-density linen-cotton blend that has been treated to ensure that your belongings remain dry, even if it’s raining. The zipper closure won’t slip open even while you’re carrying it, and the hand strap means that you can have your possessions on you at all times. In addition, this small wallet can carry just about everything you have on your person. 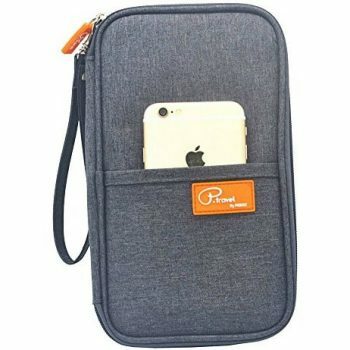 It has a pocket for your cellphone, your credit cards, keys, money, official documents, ID, and passports. That way, you have everything that you need in one place. No digging around in your purse in search of what you’re looking for. And in the event that your wallet gets soiled or stained, you can easily throw it into a washing machine and have it clean by the end of the cycle. The interior and the zipper won’t get ruined either, so it can still look as good as the day you bought it. Related: Looking for a great and easy way to keep away the mosquitoes without having to spray yourself? These SelpHbalance Mosquito Repellent Bracelets come in a pack of twelve, and contain natural oils to keep them away. These oils include lavender, lemongrass, eucalyptus, and citronella, and are safe for even children to wear. Best use: Hunting, fishing, camping. The Coghlan’s All Weather Wallet is one of the smallest and most affordable waterproof wallets you can find. It’s very small and compact, small enough to fit in your pocket without taking up too much space. And since the entire body is transparent, there’s no need to remove your ID from the wallet if requested; just hold it up, and all of your details are visible. The zip closure is easy to seal, and is designed to be waterproof so that even in the heaviest of downpours, your belongings will remain dry. Care should be exercised, however, as if there’s too much friction or moving around of the wallet, the seal can break/open, allowing moisture to get inside. To be safe, you may want to keep this in a bag of its own instead of your pants pocket to prevent this from happening. It’s a really cost-effective wallet that has all the basics. 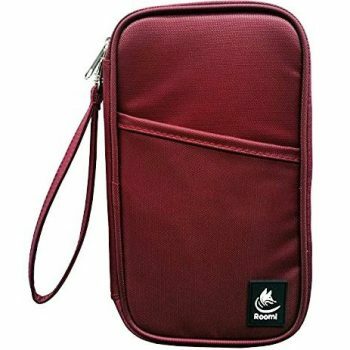 All in all, this is a great wallet for activities like boating, hiking in the rain and on the beach. Related: Ever wanted to go sailing, but you were afraid of wearing sunglasses in case they fell overboard? You’ll never have to worry again with the Chums Floating Neo Eyewear Retainer. It attaches to any shades or glasses, and is filled with foam-filled neoprene to remain floating and help you save your eyewear from the watery depths. You’ve arrived at the end of our reviews. Finding a waterproof wallet doesn’t have to be an exercise in futility, not with the knowledge we’ve armed you with throughout this article. Although shopping for a wallet may seem easy, we hope we’ve helped you learn that there’s more involved than finding the one that looks the best. So the next time you go shopping, you’ll know exactly what you should be looking for. Are there any other products you’d like us to review? Is there a story with a particular wallet you’d like to share with us? Please do so in the comments section below.